Dr Sarah McNicol of ESRI, Manchester Metropolitan University was a Co-Investigator across the three projects. She introduced the use of comics as one of the tools for the Ghost Lab inquiry. 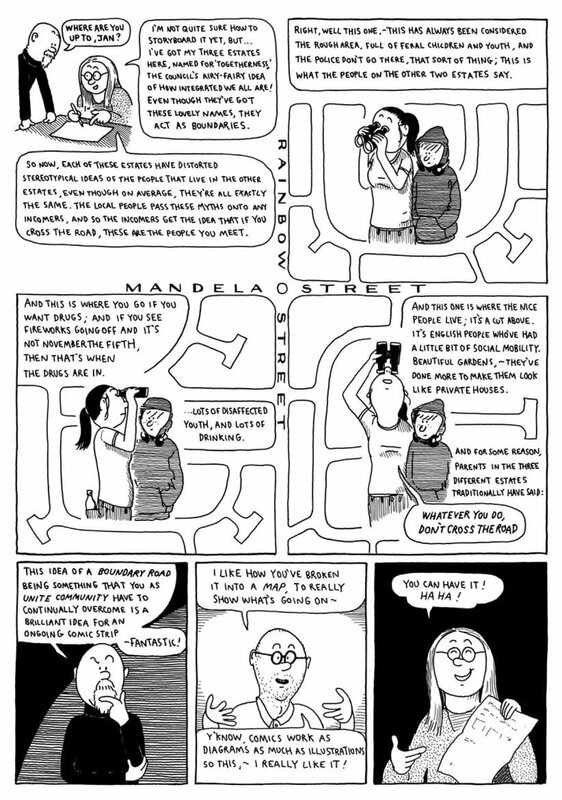 “Comics were identified as appropriate medium to explore notions of social haunting because, as Danziger-Russell (2012) argues, they “create the perfect space for the expression of voices that have been previously marginalized” (92). Through combining text and visual methods of communication, comics offer a means for the expression of interior, or silent, voices, especially of those who cannot speak for themselves, or are usually ignored. Furthermore, as Gerde and Foster (2007) argue, comics provide “alternative universes in which alternative consequences can be explored” (254), thus allowing for the exploration of counter-narratives and alternatives to conventional interpretations. Jim Medway is a comic artist commissioned in all three projects. His work ranged from sketches of meetings and discussions, to depicting poetic moments in Ghost Labs, to designing the ‘Community Tarot’ cards which were used extensively in developing our ‘Song Lines’. “The Social Haunting project has been extremely fascinating and worthwhile for me as a comic artist. Firstly, working with a variety of groups to tease out their stories, ideas and concerns using drawing and text in sequence has been a new way of working for me (usually I'm helping participants construct narratives in a much more formal way). I've found that simple combinations of words and images can have a clarity of communication for narratives that maybe aren't so straightforward. Abstract: This paper draws on Avery’s Gordon’s use of the term “social haunting” to describe the sense that all is not as it seems and something is happening which cannot be detected by our empirical senses. It explores how features of comics such as the interaction between image and text; the notion of ‘gaps’ between the frames; and methods of representing time can help us to better understand the phenomenon of social haunting. It does this through the analysis of a number of comics that can be said to reflect, in various ways, "the harm inflicted or the loss sustained by a social violence done in the past or in the present” (Gordon, 1997, xvi). Many of the ideas underpinning the concept of social haunting bear remarkable similarity to discussions to be found in comics studies literature. For example, just as Chute argues that through a dual coding system, “comics accommodates the interaction between the seeable and the sayable” (2010, 217), might they also allow for interaction between the empirical and what can be sensed in other ways? Another significant aspect of comics is the notion of ‘gaps’ between the frames which the reader must complete in order to make sense of the narrative fragments in much the same way that becoming aware of normally invisible social ghosts can help us to make sense of the more visible, but fragmented, present. The way in which comics deal with time is also an important consideration in understanding social haunting. Lacking the rigid dimension of time in their reading in comparison to a medium such as film, comics have their own, arguably more complex, methods to deal with the representation of past, present and future and the passing of time.